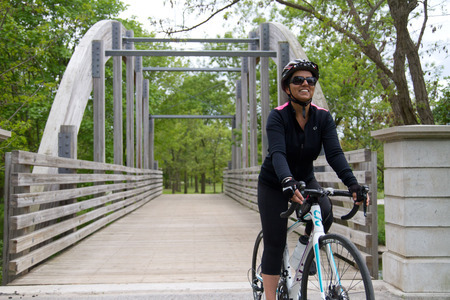 Rani was interviewed and photographed for Bike Month Cyclist Profile Series by MEC for BikeMonth.ca in their Brampton section, published May 30, 2017. We have reprinted this interview with thanks to MEC (Mountain Equipment Coop) and BikeMonth.ca for their tremendous support for June is Bike Month. The excellent photos of Rani were taken by Danielle Criscti. “I have been a Brampton native ever since my family moved here from India over 25 years ago. I love the outdoors and I love living in Canada where we get the opportunity to enjoy all the different seasons. No matter the weather, cold or hot, wet or dry, I try to get out there and embrace the great outdoors. “What style of bike do you ride? I started with a mountain bike but found that it was more difficult to go longer distances so I bought a hybrid bike. Finally I grew jealous of watching the smooth efficiency of a road biker and so I also bought a decent road bike a couple of years ago. It’s my baby. Tell us about some of the things you ride your bike for. I ride for exercise. Bonding with fellow riders. Enjoying the fresh air and being outside. There is no sport out there that can keep you outside for long hours and I love that you can see so much at the same time. Any favourite bike routes? What do you like about them? I don’t necessarily have a favorite bike route, in fact I enjoy exploring new routes and trails as part of the adventure or challenge. If I had to pick one, I do enjoy a ride up to Caledon on a weekend morning. The route winds through the beautiful and peaceful Etobicoke creek, and occasionally I even spot a deer! I usually have a nice break at the café before I head back down again. What would you say is the greatest benefit you get from cycling? I work in a stressful office environment and there is a lot of sitting down at a desk. I like being active so I find that cycling allows me to both exercise, and burn off stress. What’s your most essential piece of cycling gear? I am tempted to say my road bike, however as long as you have any well operating bike, you can go out there and participate in the joys of cycling. I would have to say my helmet. I know it sounds corny but safety first. How will you be celebrating Bike Month this year? I set a goal for myself to bike 1000 kms during Bike Month. Unfortunately, I do have to travel for work for a few days this month but I still plan on trying to accomplish my goal. What is your favourite thing about riding a bike in Brampton? I have lived in Brampton for so many years yet once I started to cycle around Brampton, I discovered so many new places and beautiful parks while following the trails. Thanks to a friend of mine, I discovered the hidden treasure in Brampton knowns as the Etobicoke Creek Trail. You can’t discover these while driving around in a car or even walking! I love that I can travel further distances on my bike. Do you have any advice for someone who wants to try bike commuting?